When the Bedford CA Van range was introduced in March 1952 it was an instant sales success. The light commercial vans being offered by Austin, Morris and Ford at the time were all based on pre-war designs and employed very primitive engineering with an appearance that owed nothing to any purposeful styling influence or creativity. 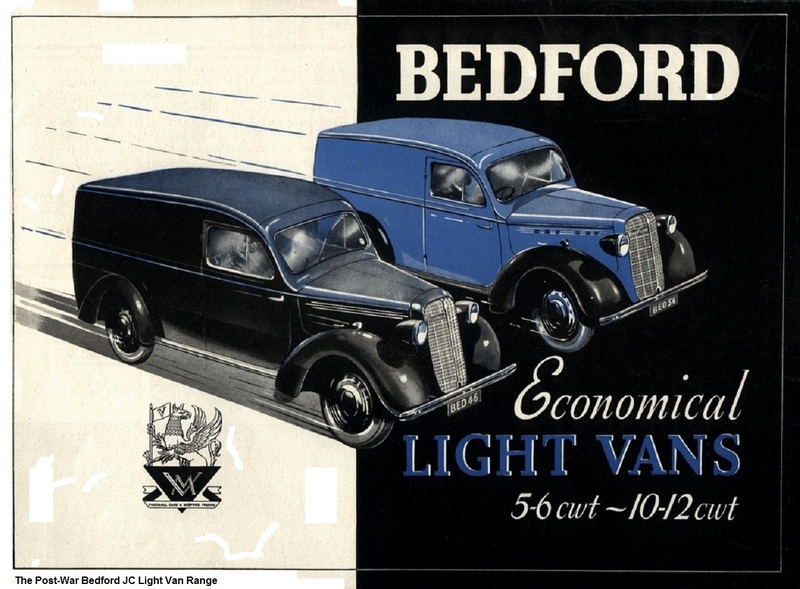 To be fair, the Bedford offerings prior to this time were only slightly better, the JC 5/6cwt & 10/12cwt vans were all based on the pre-war Vauxhall J Type 14hp car, although sales were good it was mainly of the 10/12cwt model so the new CA van would concentrate on this weight sector. The Austin K8 was the most modern British offering but was in a heavier weight class. The Bedford CA van was designed by the V Block Vauxhall Styling Department with a relatively small but extremely talented team headed up by David Jones whose own talents were becoming ever more evident. A commercial van is, almost by definition, a cargo box on wheels and therefore difficult into imagine, especially in a pretty grim post war Britain, injecting any form of styling appeal into such a vehicle. But David Jones was no ordinary designer, what he and his team created, working closely with the Engineering Department, was a supremely practical and technically advanced van that was designed from the ground up to do the exact lob it was intended for. The semi forward control provided improved comfort and space for drivers, a choice of sliding or slam doors to suit different operator requirements, an all steel body which maximised cargo load space and yet occupied little more road space that of the previous car derived vans. The driving experience was a revelation for the time, this was made possible by Maurice Platt & John Alden opting for fitment of independent front suspension adapted from the recently introduced Vauxhall E Series Wyvern & Velox models which had the additional benefit of saving costs. The CA could have been launched six months earlier but Bedford resisted the temptation and chose to wait for the introduction of the 1508cc “Square” engine from the Vauxhall Wyvern in early 1952, this was a prudent decision because the new engine was ideally suited to the Bedford CA application being exceptionally smooth, quiet & flexible as well as being remarkably economical and proved extremely reliable. It was available in low compression 52bhp form or the rare high compression 54.8bhp version. All these features were wrapped up in a design that looked modern but at the same time “homely” and quintessentially British. It’s short stubby front gave the van the nick-name “pug nose”. Shortly after launch there was the option of a 90ins or a longer 102ins wheelbase, the range was increased from 10 & 12cwt to include 15 & 17cwt versions, slam or sliding doors, factory built van or chassis cab versions. A diesel option was made available, first with the anaemic 40bhp 4-cylinder Perkins 4/99 and later the better 52bhp 4/108 version. The 3-speed column gear change enabled drivers to easily exit from either side, a 4 speed was offered from 1962 onwards. In 1964 a larger 1594cc engine from the Victor FB replaced the 1508cc unit. The split screen was changed to a one piece and the front painted grille gained a chrome version. So, there was a multitude of variations which covered the whole light to medium van market, in fact, until the Ford Transit was launched in 1965, the Bedford CA was a massive seller both in the UK and in many export markets including Canada where it was sold as a Bedford CA and also as the Envoy EASV. Production ceased in July 1969 with launch of the new Bedford CF range. Vauxhall were renowned for replacing their car models at regular intervals, sometime in as short as 3 years in some cases, but Bedford commercial vehicles seemed to suffer the opposite effect, the TK launched in 1959 was still being produced after the TL had effectively replaced it, the TJ was another typical case. When the heavy-duty TM range when launched in 1974 it was the first truly new truck for 15 years. There are many reasons cited for this, financial, the African export markets where Bedford were strongest and the typical General Motors adage at the time that all the while something kept on selling why “risk” changing it. 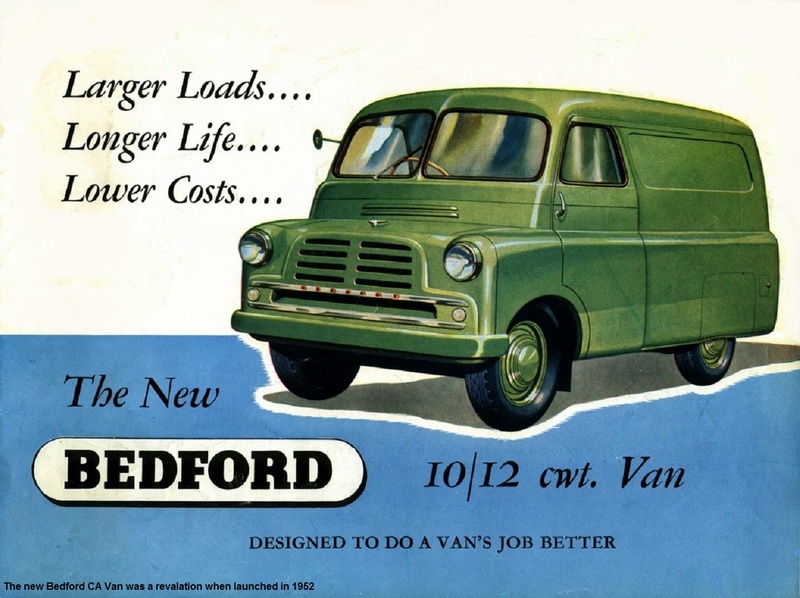 This short-sighted management strategy ended up with Bedford, once the largest producer of commercial vehicles in the World, dying a long and slow death until what was left was sold to AWD and even they were too late to save what was a great name in the truck industry. It is this latter reason that can be pinned against the CA, all the time it was selling in large quantities why take a chance and change it? That doesn’t mean there were no plans in place for a replacement, when launched Bedford considered that the van would have an approximate 8-year production life so in 1957 David Jones, who had just seen the successful launch of his masterpiece, the PA Series Cresta and Velox, began drafting possible designs for a CA replacement, logically to be called the CB Van. Despite being a true blooded Englishman David Jones always kept a watchful eye on General Motors styling trends and frequently visited the huge GM Design Centre in the States and this is generally acknowledged as to the reason why through the 50s and 60s Vauxhall cars had such a slightly transatlantic DNA in their style although it wasn’t always his preferred choice. The design parameters laid out for the CB were: Slightly longer and wider body to increase load capacity, the use of established mechanical components for reliability, a fully forward control cab design (as was about to be launched with the new TK) and an updated fresh new style. Interestingly, the wheelbase and essential chassis components were to be carried over which meant the wider body would naturally “overhang” the wheels in a similar way and for the same reasons to those of the Commer FC - still some 3 years away from launch. There were three different clay mock ups made and after a design review approval was given by the Product Planning Committee for one to move forward to prototype construction. As can be seen from the pictures David Jones had managed to incorporate, against all practical sense in a van, the “panoramic” windshield that was sweeping through GM Design Studios worldwide and had made their debut on the F Type Victor and PA Series Cresta and Velox in October 1957. The sloping rear of the design is very reminiscent of the 1958 Chevrolet panel van and the front, with no obvious central mounted grille, was a curious mix of VW and Chevrolet design cues, and the inset wheels did indeed pre-date the Commer van of 1960. Engineering for the CB was carried out by a team led by John Alden who would later rise to be Vauxhall’s chief engineer in 1963, replacing Maurice Platt. In all six road-going prototypes were built, two LHD in petrol and Perkins diesel, and four RHD versions which included two with different size Perkins diesels, one with the 1508cc petrol the other had the PA six cylinder 2262cc engine shoehorned into it and was intended as a possible heavy duty option for a 25cwt version. This heavy duty option was quickly dropped because of inadequate cooling, almost impossible routine maintenance and the fact that for the required weight limit a twin rear wheel axle would be required – which would have been possible within the outer body dimensions but was not pursued. It was also felt that with the larger body the 1508cc engine was underpowered and it was in fact the CB project that kick started development of the larger 1594cc unit which was fitted to later CA vans, and the Vauxhall Victors FB, in 1964. The vans were extensively tested at the company’s test facility at Chaul End and by all accounts acquitted themselves quite well although there were still issues with cooling with the low mounted radiator grille which relied on lengthy ducting to feed air to the radiator which was mounted in the cab. As with all prototype projects at Vauxhall they were subject to management reviews and these also included any alternative strategies and plans as to what is being proposed. The CB was eventually cancelled officially in March 1959. The reason was a simple cost comparison of introducing a completely new van versus a cosmetic and mechanical update of the CA which continued to enjoy considerable sales success. The decision at the time was probably right as it is unlikely the CB would have sold in greater numbers than the CA, if at all. There would be another concept which didn’t get beyond the clay model stage, the Bedford CD which is dealt with in another section of vauxpedia. However, everything was to change very radically in 1965 with the launch of the Ford Transit at which point sales of the Bedford CA started to fall very quickly and Vauxhall then urgently began work on a completely new CA replacement – the CF. Why CF and not CC CD or CE? The reason given by Vauxhalls Design and Engineering department was simple the “F” was because all the mechanical components to be used in the CA replacement were to come from the “F”D Victor. Of the six CB prototypes built the first to be scrapped was the six cylinder, the others were used briefly by Vauxhall running around the Luton and Dunstable plants, the last RHD diesel was broken up in July 1960. The pictures shown here are the only known to survive and show a LHD petrol model.